Hey there! I started a new freelance editing project this week. I feel like it’d be a fun exercise to document my journey through it. You’ll get to see my workflow for a project from start to end. Hopefully you can pickup some useful tips based on things I do. By doing this we will get to see my workflow and by stepping back and looking at it we can see where I excelled and where I could have done better. And most importantly it will keep me accountable to stay on track with it. Want to join me on this journey? My buddy Nick does something similar for some of his projects on his site. So yeah, I’m kinda running with his style and putting my own spin on it. The client and I met at a local hipster coffee shop. I got my go-to afternoon beverage, an iced latte. We sat and talked about what he’s expecting out of the video, how the shoot went and the usual specifics. I made sure to ask how long of a video it should be (3-5 minutes), the resolution and frame rate (1080p at 24fps), deadlines, etc. We glanced through some of the footage and he gave me some notes on some shots he would like to see in there. A crew shot four interviews on two cameras and got, at first glance, a solid amount of b-roll. The last thing I do before leaving any meeting is to make sure the next steps are clear. My next step is to sync up the audio with the interview shots then send the client the audio. This way he can mark up some of the better sound bites for me. This saves me time and even though it could take away a couple of the editing decisions from me I’m okay with it because I know the client absolutely wants these few things in video. Once I got home I immediately plugged in the client’s hard drive and my hard drive. Then I copied all the media over to my drive and reorganized it into the folder structure that I like. Next I created a new Avid project and setup my hard drive with a new Avid MediaFiles folder. I setup the footage bins and started importing in the longer clips. This took until around 10:30PM (past my bedtime) and that was it for day one. Tuesday was about two things – getting the rest of the footage imported into Media Composer and getting the interviews synced up so I can send the audio to the client. 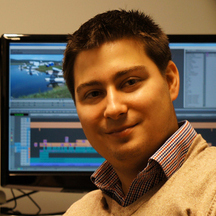 I had a couple more interview shots and about 250 short b-roll clips that took 3ish hours to get into Media Composer. I would just AMA link them however my computer has been acting funky lately and importing has been much more stable than AMAing clips. Now that everything is in Media Composer I can start organizing the interviews. I created a new sequence. Then inserted the two shots and the audio clip for the first interview. I found the slate and on the cue I cut the three clips to begin on it. Then I lined them up (1 shot on V1, 1 on V2 and the audio on A1). I played the clip to make sure the audio lined up for the one of the shots. Once it was good (I was only off by a frame) I confirmed the other shot was synced up too. Then I repeated the process for the other three interviews. I then trimmed each interview’s head and tail so it started roughly near the beginning of the interviewer’s first question and ended a couple seconds after the end of the last sound bite. Once the interviews were set I exported a WAV file of each interview. Next was to create a new ScreenLight project, add the client to the project and upload the audio files. Then I sent all the login info and status of everything over to the client. From today through Friday I’ll be going through all the interviews and b-roll clips. I’m going to label all of the shots, rank them and start building some very rough compilations of good shots next to each other. Next week’s post will pick up from this point! If you want to continue on this journey with me make sure you’ve subscribed to get email updates for new posts (just punch your email address in the box in the top-right corner!). The tentative final delivery date for this project is Friday 5/22 so there will be a couple more parts to this iteration of Over the Editor’s Shoulder. By the way, how do you like this title? Is it catchy or cheesy? I need your feedback. How am I doing? Would you do anything different up to this point? Have you learned anything? Let me know in the comments!! 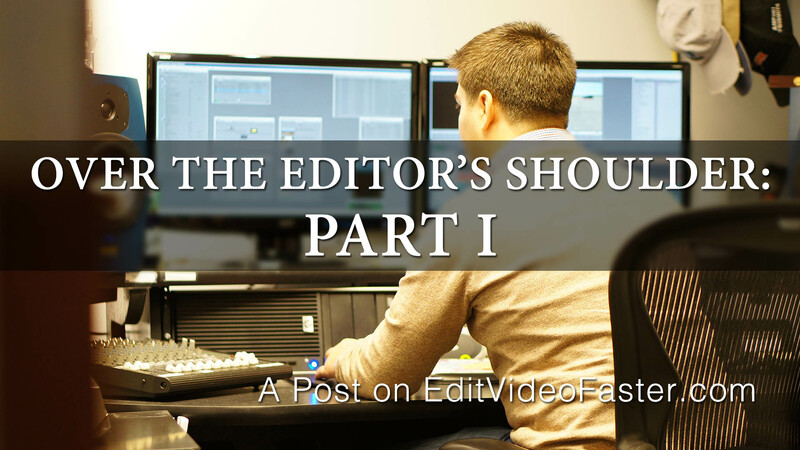 Look out for a new tutorial sometime this weekend and Over the Editor’s Shoulder: Part II will be out next week. Cheers! Read Over the Editor’s Shoulder: Part II Here! Read Over the Editor’s Shoulder: Part III Here! Read Over the Editor’s Shoulder: Part IV Here!